As a swimming pool owner in the Las Vegas dealing with high levels of Calcium Hardness and Total Dissolved Solids (TDS) is extremely common. It is because our tap water is loaded with calcium, magnesium and other hardness minerals. Since we constantly fill up our swimming pools with hard water over time this will cause problems to your interior finish and filtration equipment. If you own a residential swimming pool have you ever noticed the white ring around the pool or calcium scaling around your water features? The other big issue that we deal with is high levels of Cyanuric Acid (CYA) which is a totally different challenge that is important to discuss. Since we fill up our swimming pools with hard water, eventually it will increase in concentration. It rises in concentration because as pool water evaporates the hardness minerals remain in solution. As time goes by the water will get to a point where calcium scaling will occur on the water tile line, the interior finish, filtration equipment, saltwater chlorinators, spillways, and decorative water features. When this happens it can be tough to look at an even more challenging and expensive to remove. In the swimming pool industry, the normal levels of Calcium Hardness (CH) in water is between 200 – 400 parts per million (ppm) and TDS is recommended to be below 3000 ppm. As for CYA, the normal levels are between 30 – 50 ppm. When any of these levels get higher than that, most pool professionals will recommend changing out the water or a drain and refill. At Clark County Pool & Lawn, we recommend recycling the swimming pool water using our Reverse Osmosis (RO) mobile filtration because we can not only give you better water than tap but we can also conserve up to 85% of the existing water in the swimming pool too. This past week, we filtered a 20,000-gallon swimming pool because their calcium and CYA was high. After filtering this swimming pool for 11 hours we were able to leave them with the following ending chemistry which is much better than tap…. 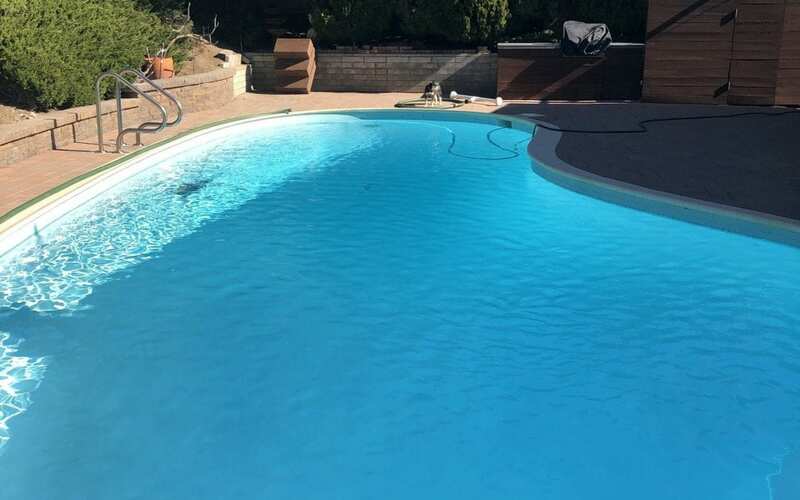 By using RO filtration we were able to give the residential swimming pool owners much better water than tap and we were able to complete this job in less than a day. We are superior to a drain and refill because in Las Vegas our tap water isn’t as good as the drinking quality water that we can achieve. RO filtration was able to drastically lower the calcium and CYA. So, if you want to swim in the best quality and prolong the lifespan of your investment, contact us today to schedule an appointment!